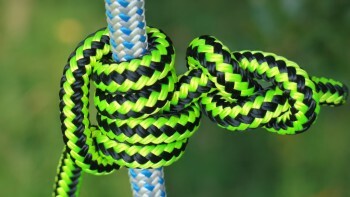 This version of the Blakes hitch is known as the four/two as it has four wraps around the climbing rope and then goes back up through two of them. The other most common variation is the five/three version. Always use a stopper knot in the tail and check it regularly to make sure it hasn’t shaken out. Use a figure eight or barrel knot as a stopper knot. The cordage used for tying the Blakes hitch should be equal to or less than the diameter of the climbing rope. It should also be made from a material that is suitable for use as friction hitch cord.